1 October: The town of Taza Kharmatho was retaken by Peshmerga and Iraqi Army forces, but remained uninhabitable, due to the booby traps that had been left by ISIL. 2 October: The Turkish Parliament voted 298:98 to authorize anti-ISIL operations, following concerns over ISIL advances close to Turkey’s borders. Turkey will allow foreign anti-ISIL military operations to be launched from within its borders and gave authorization for Turkey’s military to be sent into Syria. 3 October: Australian Prime Minister Tony Abbott announced that Australia would contribute eight F/A-18F Super Hornets to aid the war effort against Islamic extremists in Iraq. The aircraft join a KC-30A Tanker and an E-7A Wedgetail AEW&C aircraft already deployed. 3 October: ISIL released a video showing the beheading of British aid worker Alan Henning and threatened American aid worker Peter Kassig. 4 October: ISIL captured the Iraqi city of Kabisa. Two bombs killed seven people and wounded 18 in the towns of Tarmiyah and Husseiniya. An Iraqi officer and seven soldiers were killed in two ambushes in Diyala province in Iraq. 5 October: A joint ISIL–al-Nusra invasion of Lebanon was beaten back by Hezbollah. 7 October: The House of Commons of the Parliament of Canada voted 157:134 to authorize the Royal Canadian Air Force to conduct airstrikes against ISIL in Iraq. 8 October: Terrorists claiming to be “Islamic State in Gaza” took responsibility for an explosion in the French Cultural Center in Gaza City. However, a group by the same name denied responsibility for the blast. The blast did not result in casualties. The incident was downplayed by Hamas as being a generator malfunction. 10 October: Spanish Defence Minister Pedro Morenés announces that Spain will send 300 troops to Iraq in non-combat roles. 11 October: Car bombings killed at least 38 people in Baghdad. Additionally, ISIL dispatched 10,000 fighters from Syria and Mosul to take over Baghdad. Also, Iraqi Army forces and Anbar tribesmen threatened to abandon their weapons if the US does not send in ground troops to halt ISIL’s advance. 12 October: Two improvised explosive devices killed General Ahmad Sadak al Dulaymi, chief of police of the Al Anbar province, and three others. 13 October: US airplanes launched 21 strikes against ISIL forces, near the besieged town of Kobanî in northern Syria, near the border with Turkey. 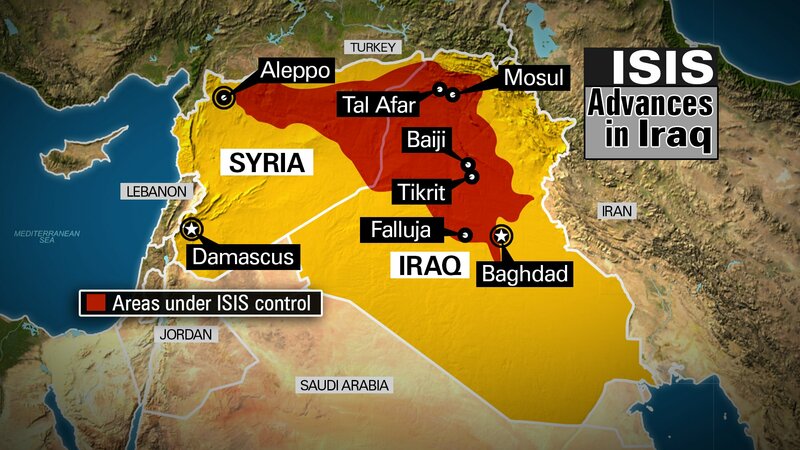 Also, ISIL fighters made it within 25 kilometers (15.5 miles) of the Baghdad Airport. 14 October: ISIL forces captured the Iraqi city of Hīt, after the 300-strong Iraqi Army garrison abandoned its local base, and about 180,000 civilians fled the area. Five Tehrik-i-Taliban Pakistan leaders in Pakistan swore loyalty to ISIL, after fundamentalists in Egypt and Libya had done the same several days earlier. A suicide car bombing killed 25 people in Baghdad, including Iraqi Parliament member and deputy leader of the Badr Organization Ahmed al-Khafaji; three others were killed by a roadside bomb. Reports spread about the formation of small Syrian groups which target and kill ISIL members in ISIL-controlled territory. Between 7 and 14 October 42 people were killed in Turkey in clashes between Kurdish fighters and ISIL supporters, 12 of them in Diyarbakir. 15 October: The US anti-ISIL operation was named “Operation Inherent Resolve”. The US launched 18 airstrikes against ISIL in Kobani. Forty-six captives were killed by ISIL in Mosul. 16 October: By this date, ISIL had been driven out of most of Kobani. Four car bombings killed 36 people and wounded 98 in Baghdad Italian Defence Minister Roberta Pinotti announced that Italy would send 280 soldiers to train Kurdish fighters, along with two Predator drones and a KC-767 refuelling plane. 17 October: Iraqi Army troops and police stormed an ISIL camp in Jaberiya, killing 60 ISIL militants; other senior ISIL figures were killed in another attack near Ramadi Three MiG-21 or MiG-23 fighters were being flown by ISIL militants who were undergoing training by former Iraqi Ba’ath officers at Al Jarrah air base. Yemen leaders of Al-Qaeda in the Arabian Peninsula urged all jihadists to join ISIL in the fight against Western “crusaders”. 17–18 October: The US launched 25 airstrikes against ISIL in Syria and Iraq. 18 October: Car bombings killed 30 people in Baghdad. 19 October: A suicide bomber killed 19 people and wounded 28 others outside a Shia mosque in Baghdad. 20 October: Airstrikes killed 60 ISIL militants in the Anbar province in Iraq. Suicide bombers and car bombings killed 43 people and wounded 85 others in Baghdad and Karbala. After preventing Kurdish reinforcements from reaching Kobani for weeks, Turkey finally agreed to let Peshmerga reinforcements pass through Turkish territory. The US Air Force started dropping weapons and supplies to the Kurds comprising the resistance in the town. ISIL members wounded and tried to kidnap Abu Nissa, the leader of the rebel group Liwa Thuwwar al-Raqqa, in the Turkish town of Urfa The remaining 2,000 Yazidis in the Sinjar area—mainly volunteer fighters but also hundreds of civilians—were forced by ISIL to retreat to the Sinjar mountains. 21 October: A series of bombings killed at least 30 people and wounded 57 others in Baghdad, while mortar shells fell inside the Green Zone. A suicide attack killed 15 Peshmerga fighters and wounded 20 near Mosul Dam. According to the SOHR, 40 fighters from Jabhat al-Nusra, including an emir, joined ISIL. It was also reported that the US had accidentally airdropped weapons to ISIL. 22 October: Car bombings killed 37 people and wounded 66 in Baghdad. Syrian Air Force claimed that it destroyed two fighter jets previously captured by ISIL at Jarrah air base. An American volunteering with the YPG claimed that ISIL have used chemical weapons during the siege of Kobani, providing photos. 23 October: ISIL militants recapture a hill to the west of Kobani. The village of Zauiyat albu Nimr and the surrounding area, in Anbar province, was captured by ISIL after weeks of fighting with the Sunni Albu Nimr tribe; 60 people were captured. Al-Sheikh Khayri, a Yazidi commander, was killed in the fighting on Mount Sinjar. Abu Qahtan, an ISIL commander, was killed in fights with Kurdish Peshmerga near Mosul Dam. The Syrian Observatory for Human Rights announced that 464 ISIL militants, 57 Al-Nusra militants and 32 civilians had been killed in U.S. air strikes since September. Also, ISIL fighters made it within 25 kilometers (15.5 miles) of the Baghdad Airport. 24 October: ISIL fighters take control of air-drop zone outside Kobani. Iraqi officials confirm that ISIL militants have targeted Iraqi troops with chemical weapons. Evidence from Kobani suggests ISIL used chemical weapons against defenders. 25 October: The Iraqi Army retakes the town of Jurf al-Sakhar (67 Iraqi soldiers and pro-government militias and 300 ISIL militants were killed in the battle, according to Iraqi sources), while Peshmerga forces retake the town of Zumar, and ten surrounding villages, killing 81 ISIL militants. The U.S. Air Force launched 22 air strikes between 24 and 25 October. Nidal Malik Hasan, the killer of the 2009 Fort Hood shooting, requested “to be made a citizen of the Islamic State”. Six Lebanese soldiers, two civilians and an at least nine militants were killed in clashes with ISIL-linked Sunni militants in the city of Tripoli, which also led to the arrest of 20 suspects. A suicide bomber killed 8 Shiite militiamen and wounded 17 in the Iraqi town of Taji. 26 October: during the Siege of Kobani, ISIL failed for the fourth time to capture the border gate with Turkey in the northern al-Jomrok neighborhood. The Iraqi army retook four villages in the Himreen mountains. Two bombs killed five people and wounded 15 in Baghdad. 27 October: ISIL car bombings killed 27 Iraqi soldiers and Shia militamen and wounded 60 in Jurf al-Sakhar, and killed 15 civilians and wounded 23 in Baghdad. The U.S. Air Force launched 11 more air strikes in Iraq and Syria. The Lebanese Army took the last positions held by ISIL militants in Tripoli, after 11 Lebanese soldiers, eight civilians and 22 militants were killed in three days of battle; 162 militants were captured. ISIL released another video with British hostage John Cantlie, in which he claimed that the city of Kobani was mostly under ISIL control, with only a few pockets of Kurdish resistance remaining. He also claimed that the Battle of Kobani was “largely over”, and that ISIL forces were mostly mopping up in the city. The captions in the video, displaying the Turkish flags at the border, claimed that it was filmed by one of the four ISIL drones. However, the video has been deemed to be ISIL propaganda, especially since analysts claim that it was filmed about a week earlier. Additionally, 200 Iraqi Kurdish forces will soon arrive in Kobani as reinforcements, via the Syrian-Turkish border. 29 October: Australian ISIL leader and recruiter Mohammad Ali Baryalei was confirmed to have been killed. Fifty Free Syrian Army and 150 Kurdish Peshmerga reinforcements reached Kobani. The US launched 14 air strikes in Iraq and Syria between 28 and 29 October. Two-hundred and twenty members of the Albu Nimr tribe were killed while captive by ISIL, 70 in Hit and 150 in Ramadi. ISIL forces captured three gas wells east of Palmyra in Homs province, and killed 30 Syrian Army soldiers in an attack on the Shaer gas field. A suicide bomber killed five policemen and wounded 18 civilians in Youssifiyah near Baghdad. ISIL released the last 25 of a group of 150 Kurdish children previously kidnapped from Kobani. The Iraqi Army retook six villages near Baiji. 30 October: ISIL captured the Shaer gas field near Homs, Syria. Norway announced that it would send 120 soldiers to Iraq to help train the Iraqi Army to fight ISIL. 31 October: The UN stated that overall 15,000 foreign fighters had joined ISIL in Iraq and Syria. While battle raged in Baiji between ISIL and the Iraqi Army and Shia militia, bombings killed 15 people and wounded 34 in and near Baghdad. Abu Bakr al-Baghdadi was proclaimed caliph of the “Islamic Caliphate of Derna” established by jihadists in Derna, Libya. The UN reported that at least 1,273 Iraqis—856 civilians and 417 members of the security forces—were killed “by violence” during October (379 civilians in Baghdad alone) and that 2,010 were wounded, not counting the casualties in Anbar province and other ISIL-held areas. 1 November: ISIL killed 50–67 more displaced members of the Albu Nimr tribe, in the village of Ras al-Maa. Thirty-five bodies of members of the same tribe were found in another mass grave. News spread that ISIL had started killing former police and army officers in areas under its control—especially Mosul—in order to prevent possible uprisings. Among those killed were Colonels Mohammed Hassan and Issa Osman. Suicide bombers and car bombings killed at least 24 people and wounded dozens in the Baghdad area. Ten US airstrikes were launched in Syria and Iraq. 2 November: ISIL killed 50–75 more members of the Albu Nimr tribe in Ras al-Maa and Haditha and 17 were kidnapped. Overall, 322 members of the Albu Nimr tribe had been killed by 2 November. Car bombings killed 44 Shia pilgrims and wounded 75 in Baghdad. Also, in response to the US-led airstrikes, representatives from Ahrar ash-Sham attended a meeting with the al-Nusra Front, the Khorasan Group, the Islamic State of Iraq and the Levant, and Jund al-Aqsa, which sought to unite several hard-line groups against the US-led Coalition and other moderate Syrian Rebel groups. 3 November: ISIL claimed to have captured the Jahar gas field in Homs province, Syria. After ransoms had been paid, 234 Yazidis kidnapped in August were released. Canadian planes launched their first airstrikes against ISIL near Fallujah. US planes launched 14 airstrikes on 2–3 November. ISIL killed 36 more members of the Albu Nimr tribe in Ras al-Maa. 4 November: ISIL released 93 Syrian Kurds kidnapped in February. 5 November: A leader of the Albu Nimr tribe stated that 540 of its members had been killed by ISIL. US allies conducted 23 airstrikes between 3 and 5 November in Iraq and Syria. The Syrian Army and militia recaptured the Jhar and Mahr gas fields near Homs from ISIL. 7 November: Car bombings in Baiji, killed eight servicemen and policemen—among them Faisal Malek—and wounded 15. The US decided to send 1,500 more troops to Iraq. 8 November: A US airstrike killed 50 ISIL militants near Mosul; rumors spread that Abu Bakr al-Baghdadi may have been killed or seriously wounded in the attack. Twenty-seven ISIL fighters were poisoned by Syrian rebels who had infiltrated as cooks into the Fath El-Shahel camp; twelve were killed. Six car bombings killed 40 people and wounded 90 in Baghdad and Ramadi. 9 November: The Syrian Air Force bombed the ISIL-held town of Al-Bab in Aleppo province, killing 21 and wounding over 100. 10 November: Seventy more members of the Albu Nimr tribe were killed by ISIL near Hit. The main Egyptian terrorist group operating in Sinai Ansar Beit al-Maqdis pledged allegiance to ISIL. RAF drones were launched in their first airstrikes against ISIL in Iraq. 11 November: A car bombing killed eight people and wounded 13 in Baiji, which had been largely recaptured by the Iraqi Army; more car bombings killed nine people and wounded 24 in and near Baghdad. 12 November: Kurdish forces in Kobanî cut off a road used as a supply route by ISIL. The road connects Kobanî with Ar-Raqqah. The Kurdish forces managed to cut off the supply route from Ar-Raqqah after capturing parts of the strategic Mistanour Hill. Idris Nassan, a local official in Kobanî, claimed that ISIL’s control over the town had been reduced to less than 20 percent. 14 November: The Iraqi Army retook the city of Baiji from ISIL. Car bombings killed 17 people and wounded 57 in Baghdad. 16 November: ISIL released a video showing a beheaded American hostage, Peter Kassig, and the beheading of 15 Syrian Army prisoners. Kurdish fighters captured six buildings from Islamic State militants besieging the Syrian town of Kobani, and seized a large haul of their weapons and ammunition. 22 November: A German father fighting at Mount Sinjar asks for more US airstrikes in the region between Sinjar and Dahuk, so that he and his family can go back to their lands and “live in peace”. 23 November: Iraqi and Peshmerga forces began a campaign to retake the towns of Jalawla and Saadiya in the Diyala Governorate, with a senior official in the Patriotic Union of Kurdistan party declaring the liberation of both towns. A Kurdish commander declared all of Jalawla to be under the control of Peshmerga forces. Several casualties were sustained when planted bombs left behind by ISIL exploded. Dozens of soldiers were wounded in the fighting. Ammar Hikmat, deputy governor of Saladin Province, announced an attack by Iraqi forces on ISIL on the Baghdad-Samarra road. Iraqi TV reported the road successfully opened. 25 November: The Syrian Arab Air Force launched a series of airstrikes on Ar-Raqqah, killing at least 60 people. A monitor for the Syrian Observatory for Human Rights reported at least 63 deaths, over half of which were civilian. The SOHR also reported the stoning to death of two young men by ISIL, for alleged homosexuality. The killings occurred in the Deir ez-Zor Governorate, one in Mayadin and the other in Deir ez-Zor. 29 November: ISIL launched a counterattack in Kobanî, by detonating four suicide cars and explosive belts, following clashes between the two conflicting parties in the town. According to the SOHR, eight YPG fighters and 17 ISIL fighters were killed in the clashes. According to the German news outlet ‘Der Spiegel’, ISIL fighters also attacked YPG positions near the border gate from Turkish soil. According to the SOHR, YPG fighters crossed the Turkish border and attacked ISIL positions on Turkish soil, before pulling back to Syria. Soon afterwards, the Turkish Army regained control of the border crossing and silos area. 2 December: According to reports, Saja al-Dulaimi, one of al-Bagdadi’s wives—or a former wife—and his daughter were arrested in Lebanon and held for questioning.